The Victoria is situated in the heart of St. Anne on the beautiful island of Alderney in the British Channel Islands. The Victoria is situated Alderney's charming capital of St. Anne, and just a stone's throw away from its sister Hotel, the Georgian House. A warm and friendly welcome awaits you upon arrival at The Victoria and the cosy, comfortable and well-equipped bedrooms are the perfect place to relax after a an exciting day of travelling. A generous home prepared breakfast made with local produce is served every morning in the pretty dining room. Families are welcome and cots and highchairs are available upon request. For your enjoyment and comfort there is a guest lounge with television, books and games and free Wi-Fi is provided throughout the premises. On Alderney you will discover unspoilt beaches, a combination of abundant wildlife with impressive landscapes, a profusion of flora and fauna, excellent restaurants, a varied history and an enviable lifestyle. Our sister hotel - just a few steps away! 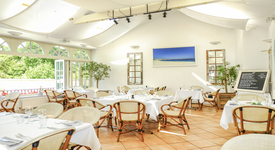 Great lunches, drinks, dinners, events and is the social hub of the island. Come and see what we have to offer you during your stay. This island is home to so much delicious home made, locally farmed and freshly caught produce and we love to show it off. Breakfasts are hearty, delicious and nutritious with daily specials to keep you eager for the morning. 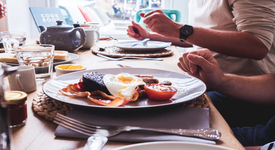 What's for breakfast at The Victoria? 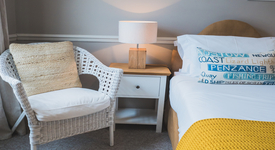 If you are looking to catch up on some some shut-eye or you need to put your feet up after a busy day exploring the island then our charming rooms will help you relax and slip into some of the best sleeps known. What makes our rooms so special?